What’s Math got to do with survival? You’ve probably never used Algebra since graduation, but this math lesson may save your life. Is there homework involved? Yes. But you choose the when, where, and how to do it. As students of self-reliance, our learning goal is 100% survivability. Shoot for 95% and your dead. You can’t bring this grade up if you’re not alive in class. In the non-math world, we describe a function as something that works every time. In mathematics, a relation is a function if the input has only one output. This works for survival, too. Your input into the Survival Function Machine (see diagram ↓) determines your output. Output is dependent upon input. Fire is only achieved with the correct input: air, fuel, and a heat source. Take one element of the input away, air, and you get charred material – not fire. This isn’t a bad thing if your intention is to make char cloth for your next fire. This is but one example that can be applied to our ultimate output → 100% survivability. In relationships, one item depends on another. There’s a relationship between fuel-heat-air and fire. When these three items combine properly, the output is fire. If fire is not the outcome, what variable caused the wood not to burn? Is the tinder marginal or damp? Is your heat source a ferro rod, flint and steel, match, bow drill ember, or Bic lighter? Do they work in your environment? Here’s an example of a relation. Let’s say you walk up to a vending machine with 6 buttons labeled 1 through 6. Pressing #1 always spits out a bottle of water; #2 gives you a candy bar; #3 gives you a sports drink; #4, a soda; #5 rolls out an apple; and #6 gives you a soda. The unlabeled buttons are related to a specific product or output. Hankering for an apple, you press #5 to get your fruit. This is a relation. Here’s another scenario with the same vending machine, same buttons, and same six products. You press button 5 expecting your apple, but instead, you get a candy bar. Some days you get an apple, some days you get the candy bar. This too is a relation. You still get a product/output when you press #5. Both scenarios describe a relation, but the second one is unreliable. You’re never sure what output you’ll get. In math, we call a relation that is always consistent a function. In survival, you want to know what you’ll get when you press a button on your Survival Function Machine – 100% of the time. You press a button and expect to get a certain outcome. When the output is not what you expect, your Survival Function Machine isn’t malfunctioning, the input needs to adjust for variability. You’ll only get your desired output (100% survivability) by feeding your Survival Function Machine quality stuff. The only way to input the good stuff is by developing knowledge and skills to use your available resources. Or as we call the process, Doing the Stuff of Self-Reliance. Practicing fire craft in ideal conditions is necessary to build confidence in this skill. But like I heard Creek Stewart say recently, mother nature makes the rules. You won’t always have dry tinder material and fuel. Mother Nature is the biggest variable you’ll have to contend with. You want to remove as many variables as possible for 100% survivability. Carrying proper gear (10 piece kit) helps eliminate variables. Bomb-proof gear. That’s what you’re after. And no, it doesn’t have to break the bank. Buy/trade/acquire the best gear you can afford. One of my best gear shops are antique stores, yard sales, and flea markets. Kit items are inanimate objects. Tossing that $300.00 knife into your Survival Function Machine will only produce the desired output if you’ve honed your knife skills. Gear + skills is a function of 100% survivability. Begin thinking about, if you haven’t already, the multi-functional uses of each piece of gear in your woodcraft kit, bug out bag, vehicle emergency kit, or get home bag. If a piece of gear has only one use, cull it. This advice does not apply to required medications. However, your 10 piece kit is a multi-functional self-aid kit. 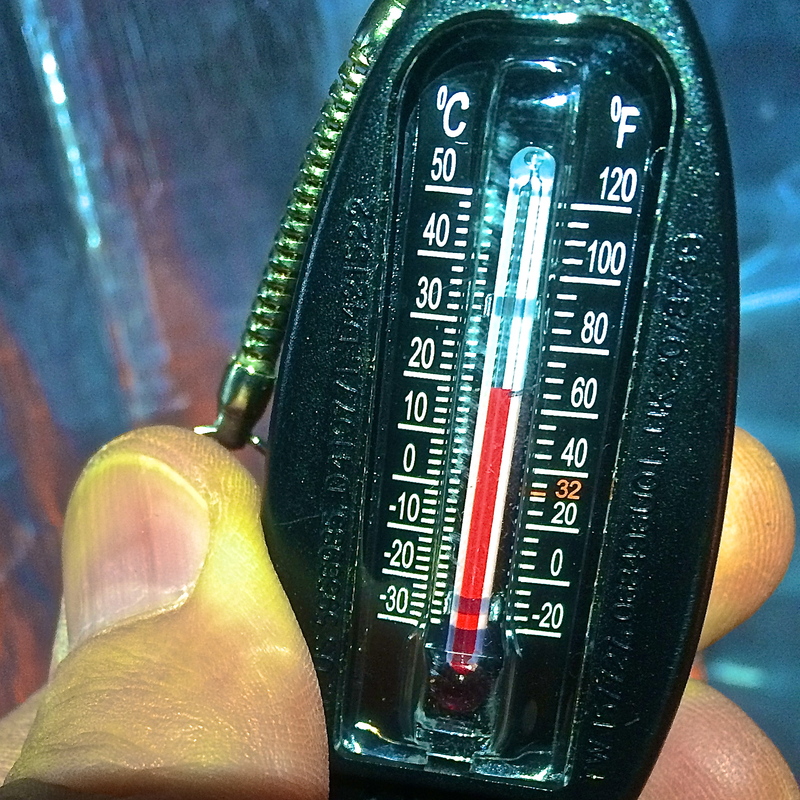 In a 72 hour wilderness survival setting, 100% survivability is dependent upon one thing… Core Temperature Control. Lacking cover and water, you won’t last long exposed to the elements. 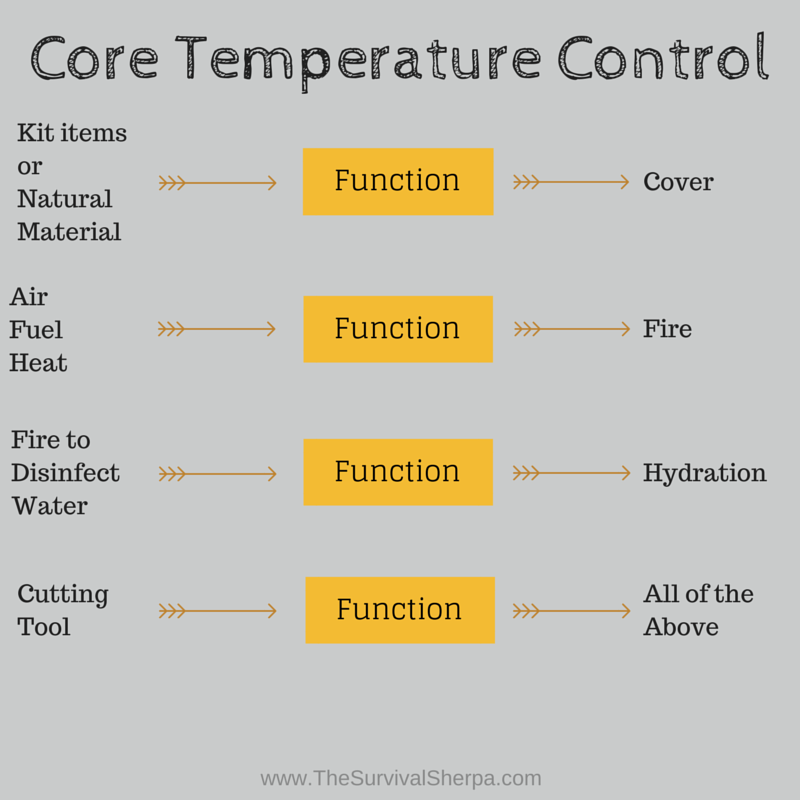 What gear/skills do you need which would enable you to add inputs to the Survival Function Machine to achieve the desired output → Core Temperature Control (CTC)? Layered clothing is your most important piece of cover. Next, you’ll need to shelter your body from the elements with either a kit item or landscape material. Are you willing to risk Mother Nature providing suitable cover resources? 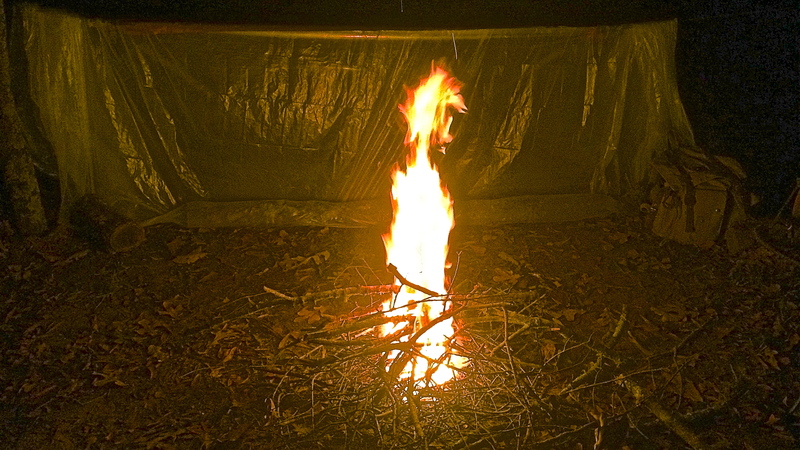 An emergency space blanket and a clear painter’s tarp weighs little but offers great return on investment as a cover element in cold weather. This kit item reduces the variability of Mother Nature. Fire. Is. Life. It effects your cover element, disinfects water, offers illumination, signalling ability, cooks food, and adds psychological comfort. Radiating heat to warm your body and shelter in cold conditions is the obvious benefit of developing fire craft skills. Always carry a field tested method of sure-fire in your kits. There’s no cheating when it comes to emergency fire! Man up, swallow your ego, and flick that Bic on some sure fire starter. The most overlooked use of fire may be disinfecting water via boiling in the winter. Staying hydrated in cold weather is just as important as during July in Georgia. In fact, winter time has a way of dulling our senses to the need to stay fully hydrated. It’s not hot out so we often overlook hydration. Boiling water is my go-to method of disinfection. That’s one reason I’m pyro-crazy about fire craft! Told you there’d be homework. Experience is a tough teacher, but she’s unforgettable. You still talk to your friends about the toughest teacher you had in school, right? Experience is the only way to build knowledge and skills which will allow you take advantage of available resources. You may gain some knowledge behind your computer screen, but experience only comes by Doing the Stuff (dirt time homework) consistently. Mathematics is the study of relationships in the real world in order to learn how things work. 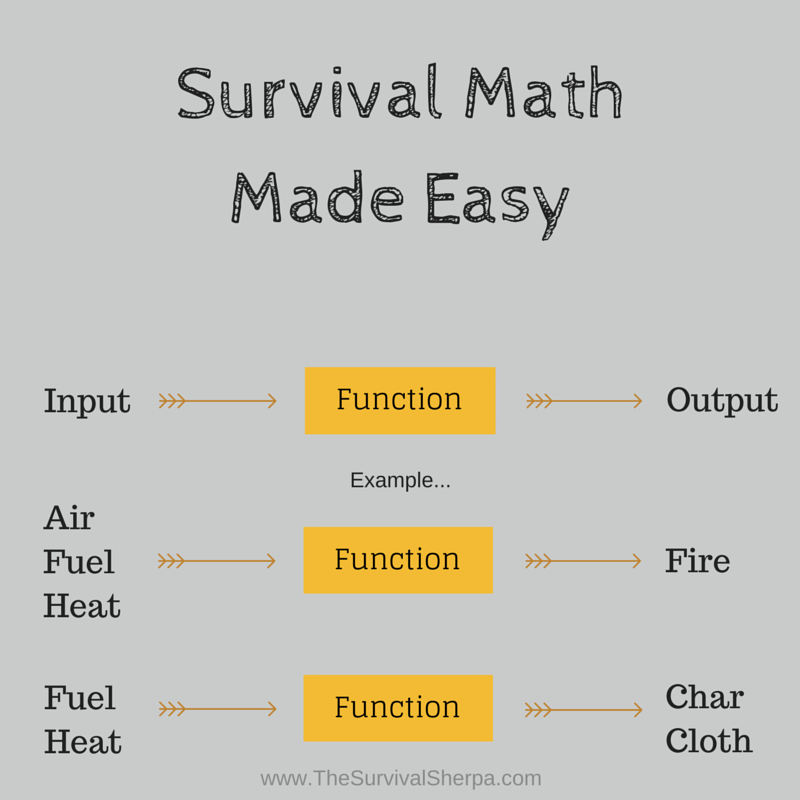 You’re not going to be using algebra in a survival situation. But the input/output concept remains. With the proper input into your Survival Function Machine, 100% survivability is the output. There’s the bell. Go get dirty! Going out in the wintertime can be dangerous, even when things are normal and you’re living at home. The cold winter weather can quickly sap your body’s heat, bringing you to the brink of hypothermia without notice. The one defense we have against the risks of cold weather is dressing properly to prevent the cold from winning the battle. Before talking about clothing, I want to make sure we understand how the human body heats itself. Our clothing doesn’t do a thing to generate heat, it merely acts as an insulator to keep that heat inside our bodies, rather than radiating it into the cold air around us. The body’s heat comes from the chemical reactions involved in breaking down food into energy and then using that energy. The heat produced is actually a by-product of the chemical reaction, albeit a by-product that we need. Glucose is considered by many to be the molecule that cells use for energy, but in fact, glucose breaks down into 38 molecules of Adenosine Tri-Phosphate (ATP), which is the molecule that cells use for energy. It is the process of breaking glucose down to ATP which provides most of our body’s heat. Each and every chemical reaction in the body produces heat. The liver, which performs more chemical reactions than any other organ, can be seen as the body’s heater. Blood actually leaves the liver warmer than it enters it. However, the liver isn’t the only heater, each and every muscle and organ performs chemical reactions, causing them to generate heat. The most consistent source of heat in our bodies is from the body’s core. The organs in our body cavity work, regardless of whether we are exercising or are at rest. Muscles, on the other hand, only produce heat when they are active. Shivering is merely a means of forcing the muscles to work, so that they will generate heat. Heat is moved though the body by the blood. As the blood passes from the core to the extremities, it carries heat with it. If there is not enough heat, this blood flow is restricted, so that the core can maintain its temperature. Many people dress in the winter by putting on the heaviest clothing they can, hoping to keep warm. In reality, that may not work. One problem with piling on the heavy coats is that it can make you too warm, causing you to sweat. You never want to be sweating in the winter, as the sweat can turn to ice, pulling out your body’s heat. The human body’s normal temperature is 98.6oF. So, if you manage to insulate yourself perfectly, it’s going to be like being outside on a 98.6 degree day. What does your body do on such a day? It sweats. Obviously, your insulation job has to be less than perfect, so that your body can get rid of excess heat and not get hot enough to sweat. 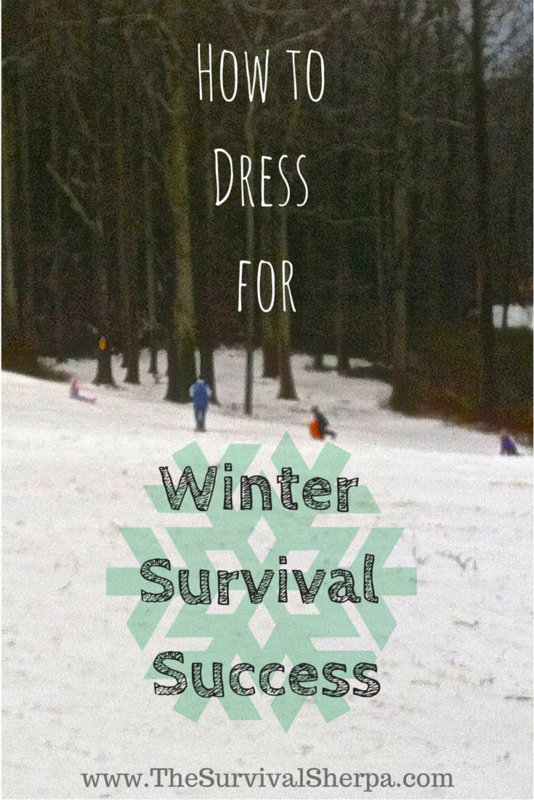 It’s actually more effective to dress in layers, than to dress in one heavy garment. That way, if you find yourself getting warm, you can remove a layer, adjusting your clothing to keep you comfortable, without keeping you too warm. Ideally, you want to be just a touch cool, rather than being warm. The most important part of your body to dress in layers is your core. You’re best off starting with a foundation of a shirt which will wick moisture away from your body. Some athletic wear is designed specifically for this, but other than that, it’s hard to find. Your next layer should be a long-sleeve sweater, preferably out of wool. Most of the time when doing physical activity outdoors, a good sweater is enough to keep you warm. Wool repels water and can actually insulate when wet; the only material that does. Over the wool sweater you should have a coat. It’s a good idea to have a selection of coats to choose from, so that you can pick one that is appropriate for the temperature. Even if your sweater will be enough for while you are working outside, you should wear a coat for the time going to and returning from that work. Having the coat with you is also a good precaution in case the temperature should drop suddenly. Any coat you buy for use in the wintertime should be water repellant. You really don’t want it to be waterproof, as that will make you sweat when you are wearing it. The best insulation for coats is down or polyester fiberfill. Unfortunately, both of those will absorb water readily. Once wet, they will make you lose your body heat considerably faster than being naked. A water repellant covering will prevent that problem. The most common pants that I see people wearing out in the cold is blue jeans, which are made of cotton. That means that they don’t resist water at all, but rather, they absorb it quite well. If you are going to wear blue jeans, then you should wear something that is water repellant over them. There are actual snow pants available on the market, for about the price of a good pair of blue jeans. These are insulated, and have a water repellant nylon covering, which makes them ideal for being out in the cold and snow. However, they may be too warm for wearing out in the snow if you are working. The leg muscles are the body’s largest and can produce a lot of heat. If you are going to be working outdoors, you’re better off with wool pants. A hat is the most important single article of clothing you wear when going outdoors in the cold. One-fourth of the body’s blood supply goes to the brain. If your head is uncovered, you will lose a lot of heat. A good hat needs to provide insulation to the head, as well as covering the ears to protect them from the cold. The best hats are actually the fur hats, called Ushanka, they wear in Russia. Good warm boots are an important part of dressing for winter weather. Your feet are the part of your body which will become cold the easiest, as well as being the part which your body restricts blood flow to, in the case of hypothermia. Wearing good warm boots, with wool socks will help prevent any risk of frostbitten toes. The last thing you need to consider is gloves. After your toes, the next place that your body restricts blood flow to in the case of hypothermia is your fingers. If you are not doing work that requires fine motor skills, mittens will keep your hands much warmer than gloves will. Having all the fingers share the same space allows them to share heat as well, keeping them warmer. Mother Nature is always true to her nature. You can’t change her. She’s beautifully rugged, awe-inspiring, and occasionally deadly. Best be prepared when she tries to make your life miserable. 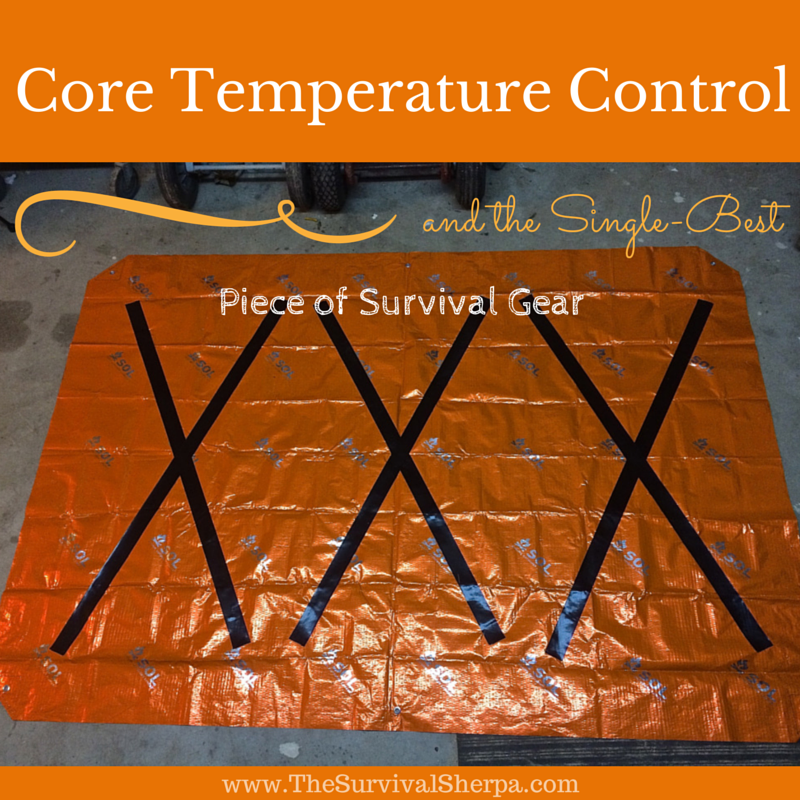 Like duct tape and WD-40 in my tool box, there aren’t many Core Temperature Control dilemmas my reusable emergency space blanket can’t fix. This may be the best 12 ounces you can add to your hunting, hiking, camping, fishing, and/or 72 hour emergency kit. Mors Kochanski, the Godfather of modern bushcraft, came up with a brilliant idea called The Super Shelter. His design takes advantage of radiant heat from fire and a layer of clear plastic sheeting to help you survive extremely cold conditions. Building The Super Shelter microclimate has been on my Doing the Stuff to-do list for a while now. Finally got some cold weather so decided to give it a test. Our midweek forecast is calling for a single digit windchill factor. A great time to put theory to the test. Firewood – lots of it! First, set up a lean-to shelter with your emergency blanket. I won’t rehash this part. For more info on this set up, click here. Lay the clear plastic over the lean-to and secure to the two back tent stakes. Nothing fancy. I simply tied each corner to the stakes. Use cordage if you’d like. Use a 6 to 7 foot long log/stick to secure the front flap over the opening of the lean-to. Roll the stick into about a foot of the front flap until the plastic is plumb under your ridge line. This secures the flap and allows a quick escape in case you need to attend to an emergency during the night. If the stick is not too large, you could simple lift it to add fuel to the fire without leaving the shelter. I kissed Dirt Road Girl goodnight around 9 PM, went out to my backyard bushcraft area and took a temperature reading inside the shelter… a brisk 24º F. For my northern friends, this may be shorts and sleeve weather, but in Georgia, that’s nippy. By morning, the mercury read 19º. I advocate trading theory for ACTION. Doing the Stuff in a controlled environment (my backyard) with untested gear and designs prepares me before I actually need the skill or kit item for survival. Onto the test. There’s no such thing as “cheating” when it comes to fire in a survival scenario. Start a sustainable fire any way you can. I used a few feet of Gorilla tape and my Bic lighter to ignite my smalls and burn my fuel-size wood. For this survival shelter, be sure to collect enough firewood to last you through the night. How much do you need? More than you just collected. A pile of dead wood the size of your shelter may get you through a freezing evening. Ideally, you’d want a fire burning the length of The Super Shelter (6 to 7 feet). For this test, my fire was only 2 feet in length. Even with this short fire, the temps inside the shelter grew to 62 degrees in less than 10 minutes. A long fire will have you “smoothing it” in your skivvies! Yep, no photo documentation of that epic event last night. Outside your first element of cover (clothing), your lightweight, multifunctional space blanket is one of the best pieces of survival kit you can carry in the woods. If you’ve dressed properly for the weather, your clothing is all you’ll need to stay warm in The Super Shelter. My layered clothing consisted of what I’d normally wear on a camping, hunting, or bushcraft outing in cold weather. Lying in the shelter for 20 minutes, I began to peel layers… wool hat first. My hunting shirt became my pillow for my uncovered head. My biggest concern was my feet as they extended past my ground mat. Not an issue. My toes were toasty warm the entire 4 hour test. Why not the entire night? Remember what I said about firewood? I burned all my firewood and the shelter loses heat quickly without a radiant fire. Note to self… Get. More. Wood! Keep in mind that this is not a long-term shelter. But for a 72-hour emergency, it is superb for Core Temperature Control. 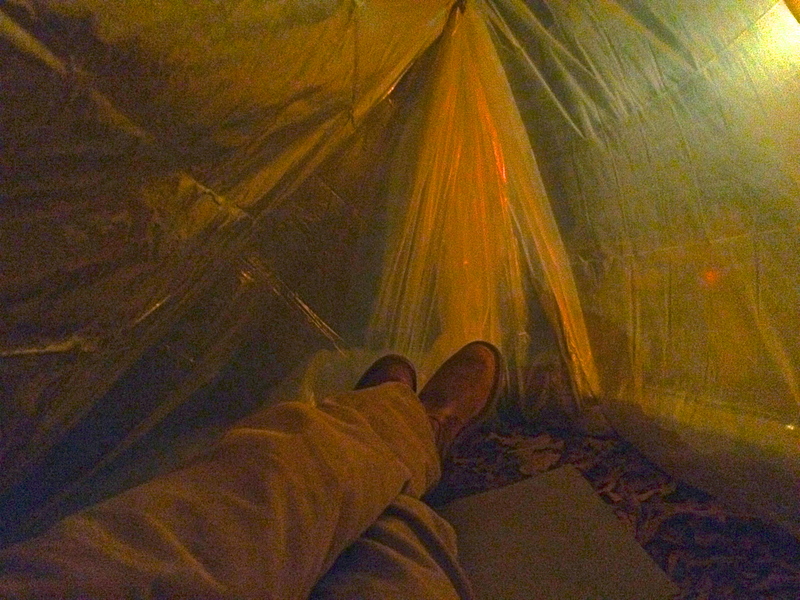 By the way, I discovered that a 9′ x 12′ foot painter’s tarp would have been enough to create this shelter. I went with a 20′ x 25′ to be sure. Even for a half night stay, the modified Super Shelter design is totally worth packing two extra pounds for extreme cold weather outings!